We would like to congratulate Eddie Braun, a 54-year old stunt man with a dream, on his much anticipated success jumping over Snake River Canyon! Billy Hammon and his crew at Action Vehicle Engineering were so pleased to have been a part of this special project. This feat was originally attempted over 40 years ago by the iconic daredevil Evel Knievel. However, the famous jump was not successful. In an effort to prove that the Knievel would have completed the jump if his parachute did not go off early, Eddie Braun began his mission. On September 16, 2016 Eddie soared through the sky at 400 mph over the canyon in a high-powered rocket named “Evel Spirit”. 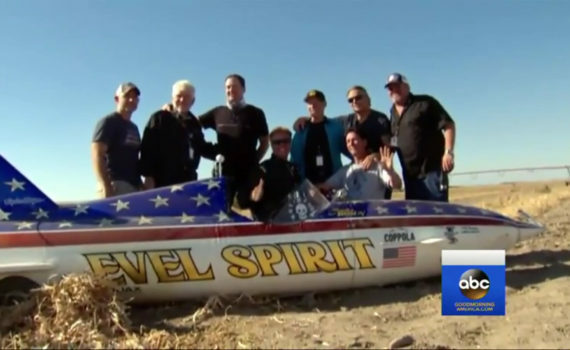 Today, our client legendary stuntman Eddie Braun successfully executed the one stunt his childhood idol Evel Kneivel never accomplished – the famous rocket flight across Snake River Canyon. During Evel’s original 1974 attempt, his parachute activated too early causing Evel to crash on live television. The event was the second most watched broadcast that year and brought in more ratings than the Super Bowl. Evel never performed after that. It ended his career. Eddie joined forces with Kelly Kneivel, Evel’s son, and Scott Traux, son of Bob Truax, the original rocket design engineer to see history righted for their fathers and to fulfill a lifelong dream of Eddie’s. Bob worked on the original space shuttle and was one of NASA’s first engineers. However, despite a decorated career, he came to be widely known for the failure of Evel’s rocket. In an effort to prove that Evel would have made it but for the parachute going off early, Eddie’s rocket, dubbed The Evel Spirit, was designed using Bob Truax’s original plans, with a few modifications for the parachute. Today, Eddie literally soared through the sky at over 400MPH powered by steam, water and 1970’s technology which included an oxygen tank from a B50 bomber, dog food can lids, and a fuel tank from a Grumman Albatross.